Today we have Dev Bentham’s latest Painting in the Rain! I want to acknowledge that I owe Dev an apology. This was supposed to go up last Wednesday, but I was traveling and despite assuring her it would indeed go up, I completely spaced on it and failed to do so. I’m sorry, Dev, and I hope that putting it up this week makes up for it a little bit. What are your names? And tell us a little about yourselves? What do you believe is your worst or most frustrating quality? What about his? What is your best quality? What about his? If you could have one wish come true, what would it be and why? Now let’s talk to Dev! What makes your current offering a different and compelling read? This is my first dual third person narrative story. In the past I’ve written from one character’s point of view—either in close third (Moving in Rhythm and August Ice) or in first (the Tarnished Souls series). While I love the more literary narrative styles that those points of view offer, I really enjoyed getting into the heads of both characters. 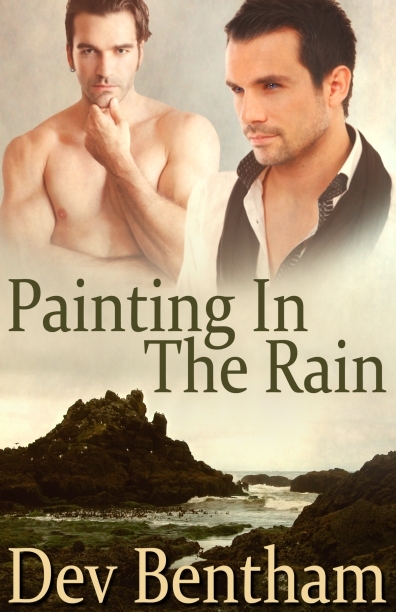 This book is also more wildly romantic than any I’ve done before, perhaps because it’s in a more standard romance format or because it’s set on the Oregon coast, an area I find deeply romantic. This is also the first story I’ve written that has a kid at the center and I’m delighted that came out on Fathers’ Day. I can’t imagine a more perfect timing for the release. What is the most rewarding aspect of writing and/or publishing? The most terrifying/frustrating? I love hearing from people who’ve enjoyed my books. One of my goals for publishing was to have people outside my circle of friends read my work. Now that that is happening, it’s both the most rewarding and the most terrifying aspect of writing—that people I’ve never met will either love or hate the stories I write. What was your favorite thing about writing these characters? I love how different these men are from each other. Mike’s a Midwestern kid, just out of graduate school and ready to start his real life. Gabe’s nine years older, an art school dropout who’s spent the past fifteen years compromising himself because of an experimental one-night stand that made him a father. Their experiences couldn’t be more different and yet they’re both aching for the same kind of whole-hearted relationship. Find Dev on the web at www.devbentham.com or email her at devbentham@yahoo.com and follow her on twitter at @DevBentham.